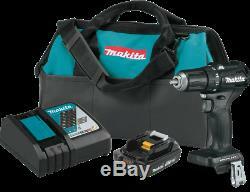 Makita XFD11R1B 18V LXT® SubCompact Brushless Cordless 1/2 DriverDrill Kit (2.0Ah). The Makita 18V LXT® Lithium-Ion Sub-Compact Brushless Cordless Driver-Drill (model XFD11R1B) is a drilling and driving solution with significantly less weight. The 18V Sub-Compact Driver-Drill is part of a new class of compact, with the size and weight of lower voltage tools but with the performance, power and compatibility of 18-Volt. The expansive breadth-of-line of the Makita 18V LXT® Series means an 18V battery from any LXT® tool will power the 18V Sub-Compact Driver-Drill. It has an efficient brushless motor with two speed settings and dual L.
Lights to illuminate the work area. Its part of Makitas expanding 18V Lithium-Ion system, the worlds largest cordless tool system powered by 18V Lithium-Ion slide-style batteries. Makita 18V Lithium-Ion batteries have the fastest charge times in their categories, so they spend more time working and less time sitting on the charger. For improved tool performance and extended battery life, Makita created Star Protection Computer Controls. For increased versatility, the tool can also be powered by Makita 18V LXT® and Compact Lithium-Ion batteries with the star symbol on the battery indicating Star Protection inside. Compact and ergonomic design at only 6-3/8 long. Weighs only 2.8 lbs. With battery for reduced operator fatigue. Ideal for working in tight spaces. Mechanical variable 2-speed transmission (0-500 & 0-1,700 RPM) for a wide range of drilling, fastening and hammer drilling applications. Lights illuminate the work area. Ergonomically designed handle with rubberized soft grip provides increased comfort. BL Brushless Motor delivers 350 in. Efficient BL Brushless motor is electronically controlled to optimize battery energy use for up to 50% longer run time per charge. The BL Brushless Motor eliminates carbon brushes, enabling the BL Motor to run cooler and more efficiently for longer life. The electronically-controlled BL Brushless Motor efficiently uses energy to match torque and RPM to the changing demands of the application. Convenient 1/2 keyless chuck for fast and easy bit installation and removal. Electric brake for maximum productivity. Extreme Protection Technology (XPT) is engineered for improved dust and water resistance for operation in harsh conditions. 18V Compact LXT® Lithium-Ion 2.0Ah battery BL1820B features an integrated L. 18V Compact Lithium-Ion 2.0Ah battery BL1820B provides up to 50% more run time per charge. 18V Compact Lithium-Ion 2.0Ah battery BL1820B reaches full charge in 25 minutes or less. Rapid Optimum Charger has a built-in fan to cool the battery for faster, more efficient charging. Equipped with Star Protection Computer Controls to protect against overloading, over-discharging and over-heating. Voltage / Charger Input Voltage. 0 - 500 / 0 - 1,700 RPM. (1) 18V LXT® Sub-Compact Brushless 1/2 Driver-Drill (XFD11ZB). (1) 18V LXT® Lithium-Ion Compact 2.0Ah Battery (BL1820B). (1) 18V LXT® Lithium-Ion Rapid Optimum Charger (DC18RC). (1) 14 Contractor Tool Bag (831253-8). Please contract us directly and provide your zip code and address type (commercial/residential). The item "Makita XFD11R1B 18V LXT SubCompact Brushless Cordless 1/2 DriverDrill Kit" is in sale since Friday, April 13, 2018. This item is in the category "Home & Garden\Tools & Workshop Equipment\Power Tools\Cordless Drills". The seller is "prussia_sales" and is located in Dayton, New Jersey. This item can be shipped to United States, all countries in Europe, Canada, China, Mexico, Japan, Australia, South Korea, Indonesia, Taiwan, South africa, Thailand, Hong Kong, Israel, New Zealand, Philippines, Singapore, Saudi arabia, United arab emirates, Qatar, Kuwait, Bahrain, Malaysia, Brazil, Chile, Colombia, Costa rica, Dominican republic, Panama, Trinidad and tobago, Guatemala, El salvador, Honduras, Jamaica, Antigua and barbuda, Aruba, Belize, Dominica, Grenada, Saint kitts and nevis, Saint lucia, Montserrat, Turks and caicos islands, Barbados, Bangladesh, Bermuda, Brunei darussalam, Bolivia, Ecuador, Egypt, French guiana, Guadeloupe, Jordan, Cambodia, Cayman islands, Sri lanka, Macao, Martinique, Maldives, Nicaragua, Oman, Peru, Pakistan, Paraguay, Reunion, Bahamas, Viet nam, Uruguay.